Q. borealis Michx. f. N. A. Sylv. 1: 98. pi. 26. 1817. A forest tree, reaching at least 900 in height, with a trunk diameter up to 30, the bark rough in plates and ridges. Leaves ovate to obovate in outline, 7-13-lobed, 4-7' long, deep green and dull above, paler green and with tufts of hairs in the axils of the leaves beneath, the acute lobes bristle-tipped, the slender leaf-stalk 2' long or less; pistillate flowers with long spreading styles; fruit maturing in the autumn of the second season; cup depressed-hemispheric, i'-¥ wide, embracing one-third to one-half of the acorn, its scales obtuse. Quebec and Ontario to New York and Pennsylvania. 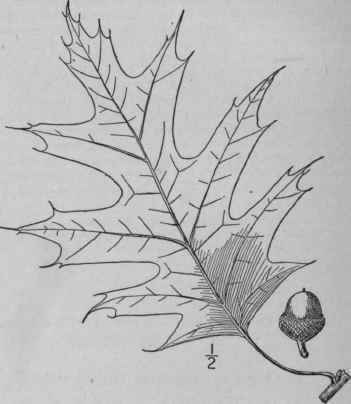 Quercus ellipsoidalis E.J. Hill, Bot. Gaz. 27: 204. 1899. A tree, becoming about 650 high, with a trunk diameter up to nearly 40, the rather thin, shallowly fissured bark grayish-brown without, yellow within, the twigs appressed-pubescent when young. Leaves broadly oval or obovate in outline, deeply pinnatifid with rounded sinuses, bright green and shining above, paler, and with tufts of hairs in the axils of the veins beneath, 2i'-6' long, the lobes and teeth bristle-tipped; fruit ripening in the autumn of the second season; cup turbinate, 5"-7" wide, embracing one-third to one-half of the ellipsoid to globose-ovoid acorn, its scales ovate, blunt. In clayey soils, Illinois to Minnesota. May. Acorns ripe Oct. Also called yellow oak and black oak. Perhaps a hybrid between Q. velutina and Q. coccinea. Q. coccinea Wang. Amer. 44. pl. 4. f. 9. 1787. A forest tree, attaining a maximum height of about 1600, the trunk diameter sometimes 50; inner bark pale reddish or gray; foliage turning scarlet in autumn. Leaves deeply pinnatifid, glabrous, bright green and shining above, paler and sometimes pubescent in the axils of the veins beneath, 4'-8' long, rather thin, the lobes oblong or lanceolate, divergent or ascending, few-toothed, the teeth and apices bristle-tipped; fruit maturing in the autumn of the second season; styles slender, recurved-spreading; cup hemispheric or top-shaped, its bracts triangular-lanceolate, appressed or the upper slightly squarrose, mostly glabrous; acorn ovoid or ovoid-globose, 6"-10" high, about twice as long as the cup. In dry soil, Maine and Ontario to Minnesota, North Carolina and Missouri. Wood hard, strong, light brown or red; weight 46 lbs. per cubic foot. May-June. 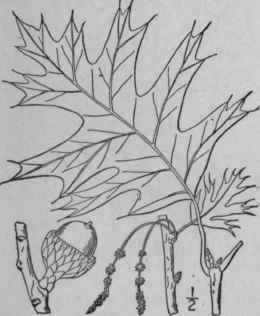 Acorns ripe Sept.-Oct. Black, red or Spanish oak. Quercus velutina Lam. Encycl. 1: 721. 1783. Q. tinctoria Bartram, Travels, 37. Name only. 1791. Q. coccinea var. tinctoria A. Gray, Man. Ed. 5, 454. 1867. A large forest tree, similar to Q. coccinea, maximum height about 1500, trunk diameter 5°; outer bark very dark brown, rough in low ridges, the inner bright orange. Leaves pinnatifid or lobed to beyond the middle, firm, brown-pubescent or sometimes stellate-pubescent when young, when mature glabrous and dark dull green above, pale green and usually pubescent on the veins beneath, the broad oblong or triangular-lanceolate lobes and their teeth bristle-tipped; fruit maturing in the autumn of the second season; cup hemispheric or top-shaped, 3/4'-1' broad, commonly narrowed into a short stalk, its bracts mostly pubescent, the upper somewhat squarrose; acorn ovoid, 1/2'-l' high, longer than the cup. Maine to Ontario, Minnesota, Florida and Texas. Wood reddish-brown; weight per cubic foot 44 lbs. May-June. 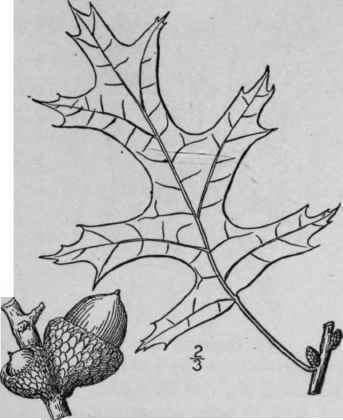 Consists of several races differing in leaf-lobing, amount of pubescence and size of acorns. 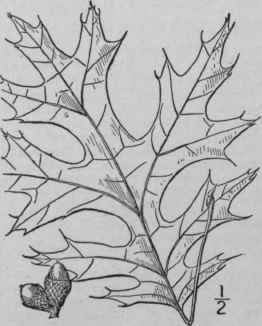 Dyer's or spotted oak. Yellow-bark oak.